Pierate - Pie Reviews: Zebra Pie: Will the Nice Zebra Pie earn its stripes? Zebra Pie: Will the Nice Zebra Pie earn its stripes? 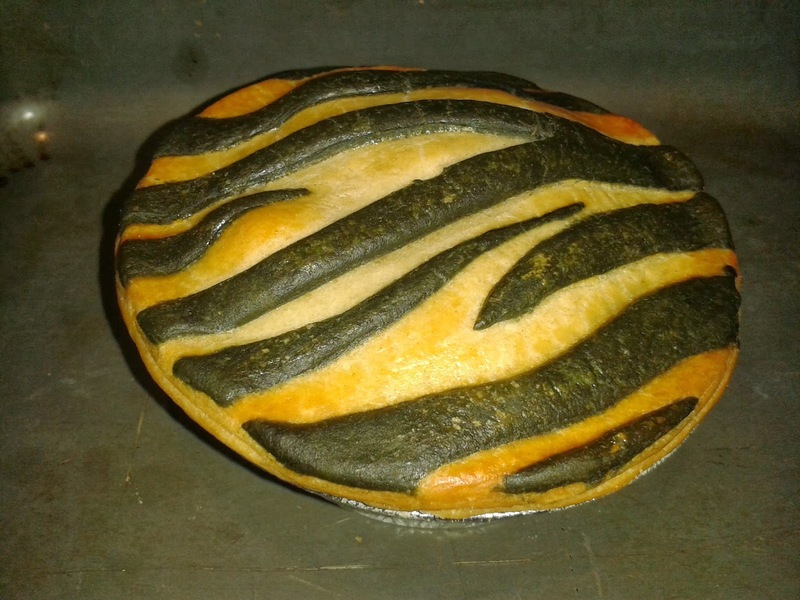 With a selection of exotic and traditional pies provided for us to rate by Nice Pie, I have to admit that the one pie out of the six that really dazzled was the black striped zebra pie. I’d herd that they were good to munch on but more importantly had chomped at the bit when eating a homemade zebra pie back last March. However at that point I thought that surely no company would make a zebra pie… so what a nice surprise to find out Nice Pie actually do! As you can see, this pie is nicely decorated with black pastry providing a striped pattern to the pie lid. While I have to admit I slightly preferred the squirrel pie design (also from Nice Pie), the zebra pattern was impressive. However when it came to the eating, the black pastry was very dry and unfortunately wasn’t very edible. Thus while providing a nice pattern, it detracted from the taste of the pie and I didn’t eat most of the black stripes. The pastry lid underneath was also a bit dry too, however the side and base pastry was nice and the filling certainly didn’t let this pie down! 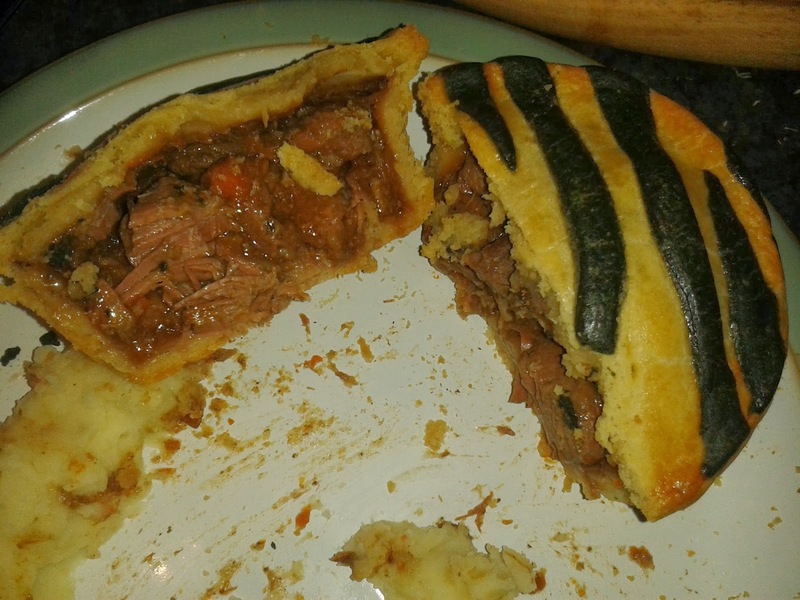 The pie was filled very strongly - with top capacity – and lots of meatilicious chunks of zebra. The meat was distributed nicely throughout the pie with a tender but flavoursome consistency. There was some veg within the pie but it was quite limited and certainly you were left in no doubt that you were eating a nice meaty pie. The flavour was a lot lighter than your typical beef steak (or horse) pie, tender and at just £3.50 for a well filled pie, a welcome break from your more traditional flavours of meat. The content was also quite nice and moist, despite there again not being much excess gravy. 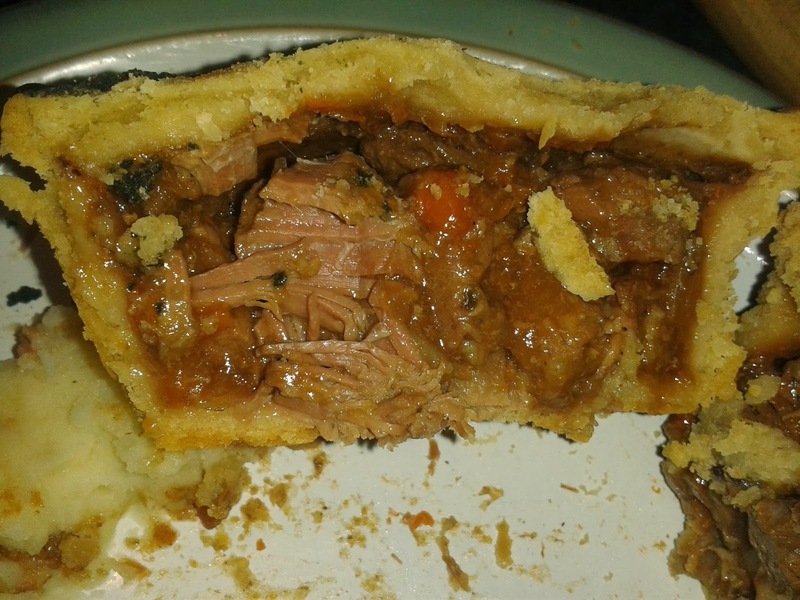 This didn’t drawback much from the content score, as the moisture of the meat was enough to mean there wasn’t a huge demand for additional gravy inside the pie, but did leave a slight bit of room for improvement. The rest of the pastry was firm but nice, holding the pie together well and not too thick. With a little work on the top pastry – despite it looking very nice as it is – the delicious, packed content of this pie still makes it a good scoring and Pierate recommended pie – one I would certainly look to eat again. It’s certainly herding in the right direction to be a top rated pie with a slight tweak to the top lid pastry. I was certainly dazzled by the unique design of the top pastry and feel it did earn its stripes as a good exotic pie. With a few little tweaks this can bolt ahead of its rivals and become an even higher rated pie!